Welcome to Basic Yoga Poses (Yoga for Seniors). If you're just beginning yoga I'm delighted to share with you a few easy yoga poses demonstrated by my beloved students (some attended 5 times a week for 15 years). May you be inspired by their joyful efforts in these few hatha yoga poses here on this page, and also throughout the entire 'Doing a 360' portal. If you're not able to get down easily on the floor, "on the mat" as we say… then perhaps some easy yoga poses done sitting in a chair would be more appropriate for you at this time. You may choose to visit my page, Yoga for Seniors if you really want to be amazed by the many wonderful yogis and yoginis I've taught over the years. About the author ~ Now that I've received an invitation to join AARP myself, I'm more seasoned in practice since beginning yoga at age 16. I gave my first lecture and demonstration the following year, and then starting teaching hatha yoga poses at 19 - and never looked back. That was 40 plus years ago! Beginning yoga is a powerful portal to the Soul, whether you do hatha yoga poses in a chair or on the mat - it doesn't matter. One of the easy yoga poses (which are called asanas) is appropriately named Easy Pose, or Sukhasana. Sukha is Sanskrit for easy; asana means seat or pose/position. Easy Pose (Sukhasana) Here we see Yogini Ethel with legs crossed sitting on a folded and rolled up towel which is placed under her at the back of her buttocks. This prop will assist until more flexibility is achieved in the hips and legs. Her back is straight with hands on knees. Usually we end a yoga session sitting up into this beginning yoga pose after lying in deep yogic relaxation. 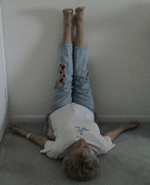 Corpse Pose (Savasana) Relaxation & Legs Up The Wall Pose (Viparita Karani) You know how to lie down on your back. Imagine that Yogini Muriel here in this photo had her legs on the floor... that would illustrate the traditional Corpse Pose. Here's a variation of the Corpse, Savasana, pronounced 'sh' avasana, with legs up on the wall. It actually has its own name, Viparita Karani, and it is very soothing, calming and restful to the system. A cushion (pillow, folded blankets) is used under the seat to support the back. Breath is soft, rhythmic and sweet. Cat Pose (Bidalasana) This photo of Yogini Irene is certainly NOT illustrating the beginning yoga pose of the Cat (which has a rounded spine). However, this is one of the nice and basic yoga poses to help older adults strengthen their (core) abdominal and back muscles while working on their balance. I call it the Table Top Pose. When you are beginning yoga (Cat Pose) start on all fours with everything 'square'… meaning, lined up. Then you round your spine gently with head down like a kitty cat stretching its back. As you reverse this gentle and conscious slow movement, the head comes up and the belly droops. You practice this series of movement a few times learning to coordinate your breath, which is very important. Yogini Claire demonstrates one of the most popular basic yoga poses today, Downward Facing Dog, Adho Mukha Svanasana. A brand new beginning yoga student in her 70s (shh... we won't tell her exact age!) she practiced diligently. Instead of the advanced Headstand, this is one of the more easy yoga poses in programs taught like Yoga for Seniors that brings energy to the head. These few basic yoga poses are a great start. There are so many more. This is just a little taste of some beginning yoga asanas, easy yoga poses (positions) that are a portal to Soul.